However you choose to wear it, the shirt dress is a great purchase because it suits every body shape. 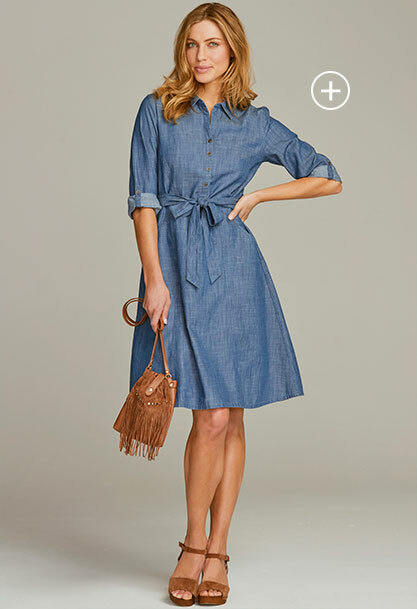 Deceivingly lightweight, this denim shirt dress is the perfect summer office outfit. Respectfully covering the upper arms and falling at just above knee-length. The added shirt collar brings a smart detail to the overall look, while the self-tie belt nips in the waist for a feminine silhouette. Made from pure, breathable cotton and is cut to a flattering fit and flare shape. With a tie waist that cinches on the slimmest portion of torso, the wrap dress gives an ultra-slimming effect. Paired with a v-neckline, the dress enhances your bust and slims over the hips, a great option for those with a pear shape or those looking to add curves. This floral mix and match hanky hem dress provides a flattering and comfortable fit. This is a great versatile sleeveless dress, wear with sandals for a day shopping or team with your favourite heels to take you from day to night. Add bohemian charm to your wardrobe with this flattering sleeveless dress, featuring a stylish hanky hem and a casual round neck. Made from stretch jersey fabric, it is comfortable enough to wear all through the day, and is fully lined for a luxurious feel. The feminine wildflower print is ideal for summer garden parties and al fresco meals.